You make a reasonable, rational case for GMOs, and back it up with evidence and logic. Clearly, you must be a SHILL OF MONSATAN. There, I said it, so the anti-GMO whackjobs who are bound to descend on this post won’t have to. You’re welcome, whackjobs. I was wondering who was going to be my number one person to tell me that! Thanks Dan! You have the honor! The only problem is, is most of this is not true. Planting the drought tolerant corn for the first time this year. It was the first variety up!! WHOHOOOO!!! Awesome! I would love to know how it works for you! AMEN!! THANK YOU and I am posting your article on my blog (copy and paste with the link back to you) my pinterest, all the fb groups I am on etc- EXCELLENT ARTICLE!!!!!! I am so sick of the gmo hype!!! Thank you Gwen! I appreciate it! Some of what you said is true but a lot is half truths. First I spent my young years on a farm and have a great love for farmers. When you said GMO’s have been occurring in nature and for a long time that is far from the truth. 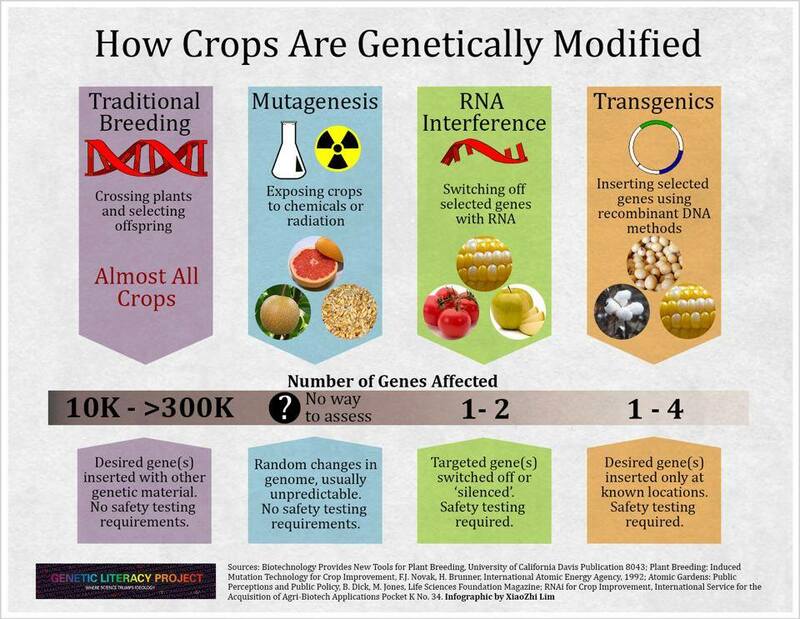 Cross pollination has occurred in nature and for a long time but GMO’s can’t occur naturally. Like a horse and a cow cross pollinating. Or to be more specific like the University of Illinois did and cross a cow with a hog. This was done to help the hog out with milk production for its young. This can’t occur naturally and is what I oppose. If it can occurs naturally fine. But your artical misrepresents the issue very much! Did you happen to read the link attached to the sweet potato? This is a relatively new discovery by scientists. I thought the same as you until I read this new discovery. Eric could please explain to me by which processes the specific sequence of snake DNA would be replicated inside the cow and how it would be transferred to the cows off spring & future generations of cows? Naturally makes no difference. Man made can be just as safe or not. Naturally is how ricin and bubonic plague occurred. The bacteria we use to genetically modify a plant was actually found in nature. It would infect the roots of the grape plant at the soil line, insert it’s DNA into the cells, then the cells would produce food for the bacteria. Creating nature’s GMO…. You right on! Much better informed than the idiot who wrote the above article. Please correct the use of pesticide vs herbicides in this article! ! Judy, it is my understanding that pesticides includes herbicides and/or insecticides. Pesticide is a broad category that includes many types of both natural and man-made control products. Rodenticides, Acaracides (spiders and mites), Molluskicides (slugs and snails), as well as insecticides and herbicides are covered by the “Pesticide” name. By the way, “Pestis” is the Latin word for plague. I just think Mother Nature made our food perfect, and we just shouldn’t mess with it!!! Grow your own, share it with those who can’t !!!!!!! You may not realize that roughly none of our food crops are found growing wild in nature (unless they have escaped from a farm). As a species, we have harvested and saved the best of each years produce and planted it, hoping to improve that crop. We have done this for thousands of years. None of our crops are left as “mother nature” provided. Our corn, wheat, oats, barley, and rye would all still be grasses with very small seeds. Not the full heads of grain we have harvested for the past few thousand years. Just try to plant your Own seeds, , Monsanto will own your farm! No way they will own my farm! They couldn’t afford it! this is just a stupid comment… Stop complaining and start your own breeding company! If a producer choose to grow seed from Monsanto it’s because they see the benefit from using them… What is the problem with royalty??? Minsanto and other seed companies put a lot in research so why they should not expect a return? Unfortunately these are the popular myths about GMOs. Monsanto has only sued farmers who purposely violated the license agreement. Farmers know they can’t save seed to plant the next year. The issue is India is false and Russia has other motives on GMOs other than safety. Hey just wondering where you got the “17 GM crops are a allowed to be imported by Europe for food/feed purposes”? I study crop & soil sciences with an emphasis on genetics and one of the main points that has been made multiple times is that there are less than 10 crops in the world that are allowed for consumtion/feed purposes. Yes there are more GM crops being worked on, but less than 10 are allowed on the market right now. I’m not attacking anyone, just would like to know where that number came from. Delaney, here is the link: http://www.theguardian.com/environment/2015/apr/16/eu-new-gm-genetically-modified-foods Thanks! Nice Article! Just would like to ask what are the drawbacks of GMOs? Is there anything to fear about them? GMOs are not roundup, but roundup is under pressure and is there any truth to roundup and decrease in water infiltration and mycorrhizal fungus and of course the decline of Monarch Butterfies due to decrease in habitat? So the drawbacks to GMO is the technology is not cheap. I don’t believe there is anything to fear. It takes an average of 13 years to bring GMO to the market place, in addition to the FDA, USDA and EPA approvals. It costs about $135,000,000 also. So roundup is under pressure but what I can say is the herbicides we used prior to Roundup were much more toxic. We only spray Roundup once on our fields. And for example, it is sprayed about 5 weeks prior to start of an ear of corn. It’s not a residual and breaks down very quickly. And I will be honest, I don’t know about the decrease in water infiltration and mycorrhizal fungus. Maybe you can enlighten me. And, yes, herbicides do kill off weeds that are a food source for the Monarchs. That’s why I appreciate the efforts for people to plant seeds that is food for Monarchs. If Roundup (glyphosate) breaks down so quickly, please explain why so many chemicals, especially glyphosate, is found in children’s bodies and mothers’ breastmilk? These are some very good points, even though I am one who is wary of GMOs, I find it crazy some of the myths that are perpetuated about these organisms. I would point out that in point #2 you might concede that genetically modified crops that resist glyphosate do *contribute* to the herbicide resistance of ‘superweeds’. Regarding point #8 you say scientist ‘know everything there is to know’ about those genes, I don’t think we can say that anyone knows ‘everything there is to know’ about anything. Science is always asking new questions and learning new things. I also live in the midwest (North Dakota), Great Plains if you prefer, and I do know farmers in our area who will not use this technology even though more work is involved to use the conventional seed. Many never question the use of GMOs, there are such differing views and I do my best to keep an open mind and learn from those who hold opinions that I disagree with. I do value that you take the time to educate on why you choose to farm the way you do. Thank you for your reply. On point #2 I would still say that herbicide resistant weeds are a separate issue from GMOs. If it’s not RoundUp it perhaps would be another herbicide. I think if farmers weren’t so lax in using only RoundUP for a number of years we would not have the problems as severe as we have them today. But, yet, I don’t blame them in the sense that RoundUp works so well. And I would have to concur with you on point #8. When you talk to scientists who work strictly with plant genetics, this is the statement they make. But I think we all know that science is changing too. And I am glad to hear you keep an open mind. I try to do the same. Again, thank you for your response! Very good article Wanda.!! I did plant some drought tolerant corn last year. It turned out great. The plants still need water to grow and reproduce, but during times of lack of moisture, it maintains good plant health. The yield was substantial over the variety planted next to it. GMO’s helped. Less water, more production. As with any new technology, I paid more per unit of seed. Thanks for pointing out the truth of GMO’s!! Thanks Corey! Hope things are going well for you! Good explanation Wanda. I would share it, but don’t want to confuse people on herbicides vs pesticides. As stated in point #2 – herbicide resistance weeds were not created due to GMO technology. Then pesticides are referred to – the chemicals which kill pests/bugs. If the article is updated to reflect the correct chemical I would love to share it! I also know that the term pesticide can be used in this manner, but it is confusing to those who don’t understand the entire subject to use it this way. Thanks for your input. And I do use the word pesticide, which includes herbicides and insecticides. I will take your advise into consideration. There was an article recently that Wanda may have shared, From Common ground, I believe? Basically it explained that all the “cides” are categories of pesticides. Athlete’s foot? Fungicide. Kids get head lice. insecticide. Red spider mites on your houseplants, miticide. Hi Wanda, thanks for making everything simple! 🙂 I have a lot to learn – I think words like GMOs have a lot of bad associations from many consumers without them doing research! Thank you! It’s my goal! This my first time at your blog and I enjoyed the reading very much! Thank you. I did read your article but I am concerned that I see no references or research linked to the counterpoints. I would have hoped to see more.